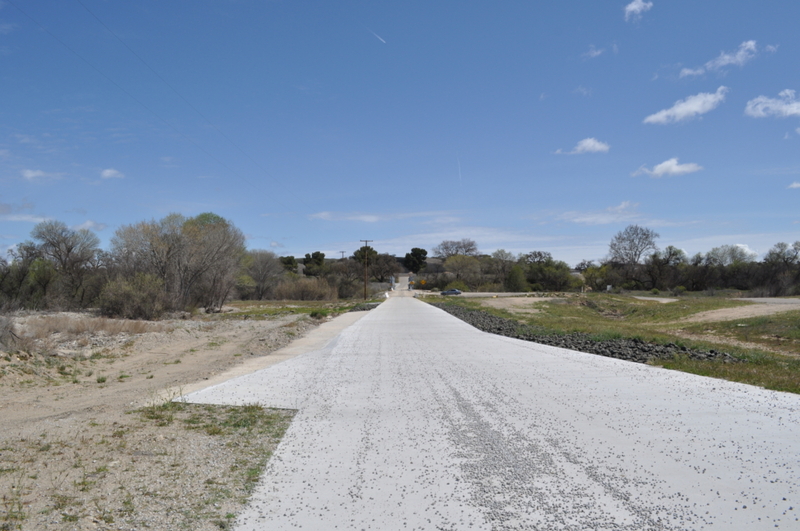 Camp Roberts Low Water Bridge Reconstruction – Yamabe & Horn Engineering, Inc.
Camp Roberts is divided by the Nacimiento River, with the operations facilities and housing located to the south, and the training ranges on the north. The primary bridge to cross the river is the high-water-bridge and is the shortest path between the training ranges and the facilities on the south. In 2009, the high-water-bridge had become too deteriorated to safely use, so the low-water-bridge located 2 miles to the west was relied upon to cross the river. As plans for reconstructing the high-water-bridge were stalled, the low-water-bridge began to show signs of significant deterioration, as well. 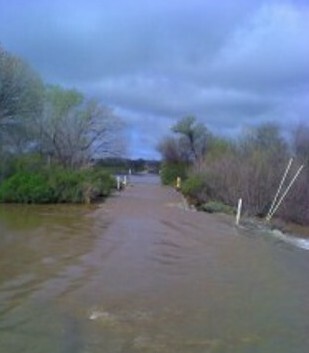 Then, in the spring of 2011, the Nacimiento River rose and the culverts under the low-water-bridge failed to accommodate the flow, resulting in the flooding of the bridge and adjoining road, making it impassible. 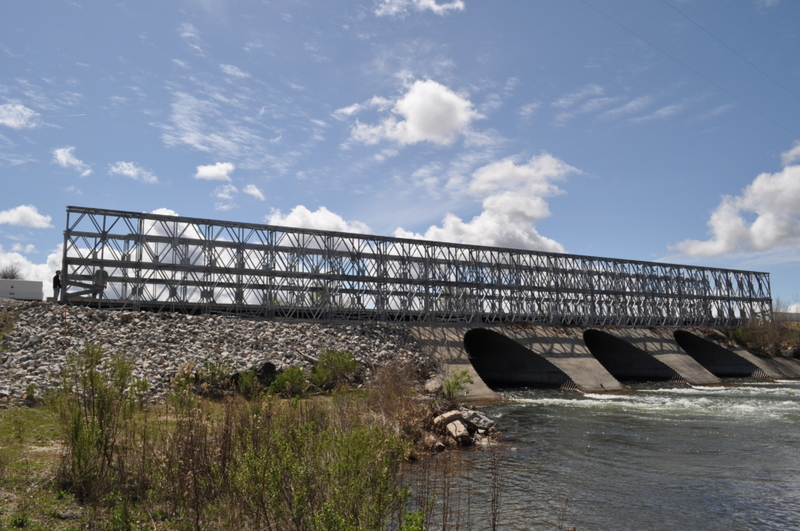 In March 2011, Yamabe & Horn was contracted to provide a cost effective solution that would facilitate construction of a new crossing and minimize the impact that the closure of the crossing would create. The project started under tremendous time constraints given the budget cycle for Camp Roberts ending on September 31, requiring Yamabe & Horn to develop a comprehensive solution that was also cost effective, within a very short 2 month window so the project could be approved before falling into the next fiscal year. With that compressed timeline, Yamabe & Horn developed a comprehensive solution that solved the immediate needs of providing safe access across the bridge, and also built in two overflow solutions that can handle the flow from a 100-year flood. The first order of business was to determine what the best option for a new bridge was, that wouldn’t require a significant closure to the crossing, would be cost effective, and wouldn’t disrupt the environmental factors within the river, causing risk of delay due to its impact. The best solution ended up being a modular bridge system from ACROW that has been used in military installations throughout the world. The bridge is actually termed a “temporary” bridge due to how easy it is to deconstruct and move to another location, but the quality and durability of the construction ensures it will be a solution that lasts for decades at Camp Roberts. Having it pre-constructed and engineered for handling heavy vehicle traffic provided significant savings to the Camp. With the crossing design handled, the next order of business was to resolve the flooding of the road during high flow seasons. Looking at the original riverbed pattern, it was determined that installing a secondary culvert north of the bridge would serve as the primary overflow route. Beyond that, a concrete mat was placed over the road to the north of the bridge, providing an armored flood relief that directed the water back to the riverbed from the edges and would limit flood depth to 6-inches during the most extreme river levels. This ensured that the road was always crossable, even during flooding. The construction timeline was limited to 30-days to minimize the impact to the troops as the only access left to the training ranges was from Highway 101 through a north gate, requiring the posting of temporary guard staff. With a 22 day cure rate on the concrete that was placed on the road north of the bridge for the armored flood relief, the window was incredibly tight for construction. Installation of the new bridge was done directly over the existing culvert system, with approximately 6-inches of clearance between the two structures, so the old, culverts can easily be removed should the environmental impact be deemed worthwhile. The project was started the weekend after Thanksgiving and completed within 24 days, allowing the Camp to begin using it by the first week of January when troops returned from holiday.